•Treatment of severe PCP (alveolar arterial oxygen diffusion gradient [(A-a)DO2] >45 mm Hg) with atovaquone oral suspension has not been studied. •The efficacy of atovaquone oral suspension in subjects who are failing therapy with TMP-SMX has also not been studied. Atovaquone oral suspension is indicated for the prevention of Pneumocystis jiroveci pneumonia (PCP) in adults and adolescents (aged 13 years and older) who cannot tolerate trimethoprim-sulfamethoxazole (TMP-SMX). Clinical experience with atovaquone oral suspension, USP for the treatment of PCP has been limited to subjects with mild-to-moderate PCP (alveolar-arterial oxygen diffusion gradient [(A-a)DO2] ≤45 mm Hg). Treatment of more severe episodes of PCP with atovaquone oral suspension, USP has not been studied. The efficacy of atovaquone in subjects who are failing therapy with TMP-SMX has also not been studied. Administer atovaquone oral suspension with food to avoid lower plasma atovaquone concentrations that may limit response to therapy [see Warnings and Precautions (5.1), Clinical Pharmacology (12.3)]. Shake sachet gently before administering the recommended dosage. Atovaquone oral suspension, USP is a bright yellow, citrus-flavored, oral suspension containing 750 mg of atovaquone, USP in 5 mL. Atovaquone oral suspension, USP is supplied in 5 mL sachets. If treating patients with severe hepatic impairment, closely monitor patients following administration of atovaquone. Dapsone Comparative Trial: In the dapsone comparative trial (n = 1,057), the majority of subjects were white (64%), male (88%), and receiving prophylaxis for PCP at randomization (73%); the mean age was 38 years. Subjects received atovaquone oral suspension 1,500 mg once daily (n = 536) or dapsone 100 mg once daily (n =521); median durations of exposure were 6.7 and 6.5 months, respectively. Adverse reaction data were collected only for adverse reactions requiring discontinuation of treatment, which occurred at similar frequencies in subjects treated with atovaquone oral suspension or dapsone (Table 1). Among subjects taking neither dapsone nor atovaquone at enrollment (n = 487), adverse reactions requiring discontinuation of treatment occurred in 43% of subjects treated with dapsone and 20% of subjects treated with atovaquone oral suspension. Gastrointestinal adverse reactions (nausea, diarrhea, and vomiting) were more frequently reported in subjects treated with atovaquone oral suspension (Table 1). Pentamidine Comparative Trial: In the pentamidine comparative trial (n = 174), the majority of subjects in the primary therapy trial population (n = 145) were white (72%) and male (97%); the mean age was 37 years. Subjects received atovaquone 750 mg (three 250-mg tablets) 3 times daily for 21 days or a 3- to 4-mg/kg single pentamidine isethionate IV infusion daily for 21 days; the median durations of exposure were 21 and 14 days, respectively. Concomitant administration of tetracycline and atovaquone oral suspension has been associated with a reduction in plasma concentrations of atovaquone [see Clinical Pharmacology (12.3)]. Caution should be used when prescribing tetracycline concomitantly with atovaquone oral suspension. Monitor patients for potential loss of efficacy of atovaquone if co-administration is necessary. Concomitant administration of atovaquone and indinavir did not result in any change in the steady-state AUC and Cmax of indinavir but resulted in a decrease in the Ctrough of indinavir [see Clinical Pharmacology (12.3)]. Caution should be exercised when prescribing atovaquone oral suspension with indinavir due to the decrease in trough concentrations of indinavir. Monitor patients for potential loss of efficacy of indinavir if co-administration with atovaquone oral suspension is necessary. Atovaquone oral suspension, USP is a formulation of micro-fine particles of atovaquone, USP. The atovaquone particles, reduced in size to facilitate absorption, are significantly smaller than those in the previously marketed tablet formulation. Atovaquone oral suspension, USP is for oral administration and is bright yellow with a citrus flavor. Each teaspoonful (5 mL) contains 750 mg of atovaquone, USP and the inactive ingredients benzyl alcohol, flavor (ethanol, propylene glycol, triacetin), poloxamer 188, purified water, saccharin sodium and xanthan gum. Atovaquone is a highly lipophilic compound with low aqueous solubility. The bioavailability of atovaquone is highly dependent on formulation and diet. The absolute bioavailability of a 750-mg dose of atovaquone oral suspension administered under fed conditions in 9 HIV-1-infected (CD4 >100 cells/mm3) volunteers was 47%±15%. Administering atovaquone with food enhances its absorption by approximately 2-fold. In one trial, 16 healthy volunteers received a single dose of 750 mg atovaquone oral suspension after an overnight fast and following a standard breakfast (23 g fat: 610 kCal). The mean (±SD) area under the concentration-time curve (AUC) values under fasting and fed conditions were 324 ± 115 and 801 ± 320 h•mcg/mL, respectively, representing a 2.6 ± 1-fold increase. The effect of food (23 g fat: 400 kCal) on plasma atovaquone concentrations was also evaluated in a multiple-dose, randomized, crossover trial in 19 HIV-1-infected volunteers (CD4 <200 cells/mm3) receiving daily doses of 500 mg atovaquone oral suspension. AUC values under fasting and fed conditions were 169 ± 77 and 280 ± 114 h•mcg/mL, respectively. Maximum plasma atovaquone concentration (Cmax) values under fasting and fed conditions were 8.8 ± 3.7 and 15.1 ± 6.1 mcg/mL, respectively. Plasma atovaquone concentrations do not increase proportionally with dose. When atovaquone oral suspension was administered with food at dosage regimens of 500 mg once daily, 750 mg once daily, and 1,000 mg once daily, average steady-state plasma atovaquone concentrations were 11.7 ± 4.8, 12.5 ± 5.8, and 13.5 ± 5.1 mcg/mL, respectively. The corresponding Cmax concentrations were 15.1 ± 6.1, 15.3 ± 7.6, and 16.8 ± 6.4 mcg/mL. When atovaquone oral suspension was administered to 5 HIV-1-infected volunteers at a dose of 750 mg twice daily, the average steady-state plasma atovaquone concentration was 21 ± 4.9 mcg/mL and Cmax was 24 ± 5.7 mcg/mL. The minimum plasma atovaquone concentration (Cmin) associated with the 750-mg twice- daily regimen was 16.7 ± 4.6 mcg/mL. Trimethoprim/Sulfamethoxazole: The possible interaction between atovaquone and TMP-SMX was evaluated in 6 HIV-1-infected adult volunteers as part of a larger multiple-dose, dose-escalation, and chronic dosing trial of atovaquone oral suspension. In this crossover trial, atovaquone oral suspension 500 mg once daily (not the approved dosage), or TMP-SMX tablets (trimethoprim 160 mg and sulfamethoxazole 800 mg) twice daily, or the combination were administered with food to achieve steady state. No difference was observed in the average steady-state plasma atovaquone concentration after co-administration with TMP-SMX. Co-administration of atovaquone with TMP-SMX resulted in a 17% and 8% decrease in average steady-state concentrations of trimethoprim and sulfamethoxazole in plasma, respectively. 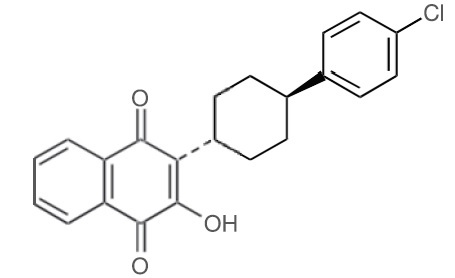 Atovaquone is a hydroxy-1,4-naphthoquinone, an analog of ubiquinone, with antipneumocystis activity. The mechanism of action against Pneumocystis jiroveci has not been fully elucidated. In Plasmodium species, the site of action appears to be the cytochrome bc1 complex (Complex III). Several metabolic enzymes are linked to the mitochondrial electron transport chain via ubiquinone. Inhibition of electron transport by atovaquone results in indirect inhibition of these enzymes. The ultimate metabolic effects of such blockade may include inhibition of nucleic acid and adenosine triphosphate (ATP) synthesis. Several laboratories, using different in vitro methodologies, have shown the IC50 (50% inhibitory concentration) of atovaquone against P. jiroveci to be 0.1 to 3 mcg/mL. Phenotypic resistance to atovaquone in vitro has not been demonstrated for P. jiroveci. However, in 2 subjects who developed PCP after prophylaxis with atovaquone, DNA sequence analysis identified mutations in the predicted amino acid sequence of P. jiroveci cytochrome b (a likely target site for atovaquone). The clinical significance of this is unknown. This open-label trial enrolled 1,057 subjects, randomized to receive atovaquone oral suspension 1,500 mg once daily (n = 536) or dapsone 100 mg once daily (n= 521). The majority of subjects were white (64%), male (88%), and receiving prophylaxis for PCP at randomization (73%); the mean age was 38 years. Median follow- up was 24 months. Subjects randomized to the dapsone arm who were seropositive for Toxoplasma gondii and had a CD4 count <100 cells/mm3 also received pyrimethamine and folinic acid. PCP event rates are shown in Table 7. Mortality rates were similar. The indication for treatment of mild-to-moderate PCP is based on the results of two efficacy trials: a randomized, double-blind trial comparing atovaquone tablets with TMP-SMX in subjects with HIV/AIDS and mild-to-moderate PCP (defined in the protocol as [(A-a)DO2] ≤45 mm Hg and PaO2 ≥60 mm Hg on room air) and a randomized open-label trial comparing atovaquone tablets with IV pentamidine isethionate in subjects with mild-to-moderate PCP who could not tolerate trimethoprim or sulfa antimicrobials. Both trials were conducted with the tablet formulation using 750 mg three times daily. Results from these efficacy trials established a relationship between plasma atovaquone concentration and successful outcome. Successful outcome was defined as improvement in clinical and respiratory measures persisting at least 4 weeks after cessation of therapy. Comparative pharmacokinetic trials of the suspension and tablet formulations established the currently recommended suspension dose of 750 mg twice daily [see Clinical Pharmacology (12.3)]. This double-blind, randomized trial compared the safety and efficacy of atovaquone tablets with that of TMP-SMX for the treatment of subjects with HIV/AIDS and histologically confirmed PCP. Only subjects with mild-to-moderate PCP were eligible for enrollment. A total of 408 subjects were enrolled into the trial. The majority of subjects were white (66%) and male (95%); the mean age was 36 years. Eighty-six subjects without histologic confirmation of PCP were excluded from the efficacy analyses. Of the 322 subjects with histologically confirmed PCP, 160 were randomized to receive 750 mg atovaquone (three 250-mg tablets) 3 times daily for 21 days and 162 were randomized to receive 320 mg TMP plus 1,600 mg SMX 3 times daily for 21 days. Therapy success was defined as improvement in clinical and respiratory measures persisting at least 4 weeks after cessation of therapy. Improvement in clinical and respiratory measures was assessed using a composite of parameters that included oral body temperature, respiratory rate, severity scores for cough, dyspnea, and chest pain/tightness. Therapy failures included lack of response, treatment discontinuation due to an adverse experience, and unevaluable. This unblinded, randomized trial was designed to compare the safety and efficacy of atovaquone with that of pentamidine for the treatment of histologically confirmed mild or moderate PCP in subjects with HIV/AIDS. Approximately 80% of the subjects either had a history of intolerance to trimethoprim or sulfa antimicrobials (the primary therapy group) or were experiencing intolerance to TMP-SMX with treatment of an episode of PCP at the time of enrollment in the trial (the salvage treatment group). A total of 174 subjects were enrolled into the trial. Subjects were randomized to receive atovaquone 750 mg (three 250-mg tablets) 3 times daily for 21 days or pentamidine isethionate 3- to 4-mg/kg single IV infusion daily for 21 days. The majority of subjects were white (72%) and male (97%); the mean age was approximately 37 years. Thirty-nine subjects without histologic confirmation of PCP were excluded from the efficacy analyses. Of the 135 subjects with histologically confirmed PCP, 70 were randomized to receive atovaquone and 65 to pentamidine. One hundred and ten (110) of these were in the primary therapy group and 25 were in the salvage therapy group. One subject in the primary therapy group randomized to receive pentamidine did not receive trial medication. 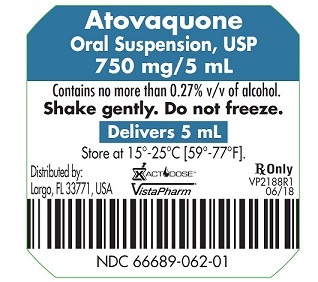 Atovaquone oral suspension, USP (bright yellow, citrus-flavored) containing 750 mg atovaquone, USP in each teaspoonful (5 mL). • NDC 66689-062-018: Case contains 18 unit-dose sachets of 5 mL (NDC 66689-062-01). • NDC 66689-062-042: Case contains 42 unit-dose sachets of 5 mL (NDC 66689-062-01). Store at 15° to 25°C (59° to 77°F). Do not freeze. Dispense in tight container as defined in USP. Shake gently. Do Not Freeze.